If you’re like many people, the word taxes gets your belly in knots! 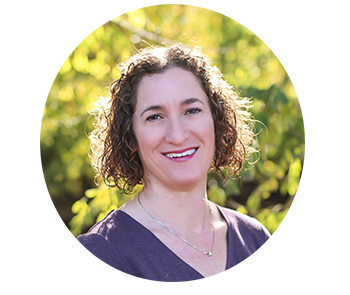 Even if you’re good with numbers and stay on top of things, it can be hard to understand all the different aspects to taxes. That’s not even counting if there has been a change in your life in the past year and keeping up with new tax laws. With change comes the need to file new forms you’ve never seen before. 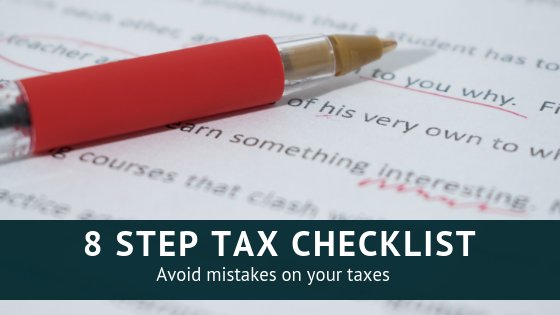 Here’s an 8 step checklist to help you avoid mistakes on your taxes the first go around. One of the most easily avoidable mistakes is not filing your taxes on time. While you may think it’s okay to be a little late with filing, here’s why that’s not such a good idea. While you can file for an extension, it’s always better to pay estimates before the April 15th deadline to avoid paying interest to the IRS. If you don’t pay your taxes on time, you will end up paying a penalty. The penalty will be 5% of any unpaid tax each month up to 25%. If you file more than 60 days late, there are additional penalties. If you’ve filed but didn’t pay any balance owed, you will also get charged interest. No one likes owing more money than necessary, right? You’re paying enough taxes already. Don’t let your procrastination cost you even more. Even if you’re great with numbers, it’s easy to make math errors on your tax return. Those mistakes can end up coming back to haunt you later. Again, avoid mistakes on your taxes. If you catch an error yourself at a later date, you can always file an amended return to fix it. This will keep you right with the IRS and avoid any penalties and taxes owed. However, if the IRS catches the error, you’ll be notified via a letter from the IRS and may see your refund decreased or further taxes owed. Do yourself a favor and hire a professional to do your taxes so errors don’t happen. Plus, in the event you do get a letter in the mail from the IRS, you have a trusted tax professional by your side to help you with the problem. At the very least, have someone else look over your return for mathematical errors before you file. Unless your return is super simple and straightforward, you might be missing out on deductions and credits. You’ll generally be in a better position if you choose to work with a credentialed tax professional like an Enrolled Agent. Remember, if you choose to hire a tax professional, do some research and make sure you work with someone you trust. Choosing an under-qualified tax preparer or one that is not focused on filing an accurate return can easily put you in jeopardy. At the end of the day, you, the taxpayer, will always be held liable for additional taxes and penalties for any mistakes and potentially fraudulent claims on your return. If you’re self-employed like me, it’s especially important to make quarterly estimated payments. If you don’t, you most likely will end up paying for it later. While you may think it’s easier if you’re an employee since your employer is automatically deducting taxes from your paycheck, it’s still your responsibility to make sure your employer is withholding enough from your paychecks. If you have a double income household, your combined incomes could move you to the next tax bracket. It’s a common mistake to not withhold enough via a paychecks or skip making estimated tax payments. Not paying enough over the year can make you subject to the underestimation penalty. This is based on what should have been paid, but was not. While it might not be a large dollar amount, but it is throwing money away. Plus, it’s easily avoidable. In the end make sure that you’re paying the right amount of taxes throughout the year. Then you won’t be surprised with a huge payment that’s now even more expensive because of additional penalties. Many taxpayers miss out on deductions from charitable contributions. In order to make the most of these deductions, keep your receipts and take pictures of physical goods. If you donate goods, keep a detailed list of what you donated. I use google sheets for this. Before you bring the items to the donation center, take some photos. It’s easier than ever to do this with our smartphones in our pockets. Did you know you there is a mileage rate for charity miles? That’s right! If you drive to volunteer at a local church or other non-profit organization, you can count those miles towards your charity donation. You can also deduct parking fees and tolls in addition to the standard mileage rate. This includes submitting the wrong bank account numbers for payments or direct deposit AND typing a name wrong. FIrst, you should definitely use direct deposit for any refund. It really is the quickest way to see your money in your account. However, it’s important to double check you have the right bank account numbers when e-filing. Make sure any names filed with the return match your social security exactly. If names don’t match exactly, your tax refund could be delayed. Get it right the first time and save yourself some hassle. Are you guilty of waiting until tax time and then hoping you have enough money to pay for your taxes? If so, you may want to rethink your strategy. One way to prepare for tax time is to put away money throughout the year to meet your tax obligation. If you’re self employed and paying quarterly estimates, you still may owe a little more. Better to have a little extra cash for fun than to worry about paying a tax bill. If you work for someone else and receive a W2, you may be surprised that your company withholdings aren’t enough. Your company does not know about any outside activities in your life or if you have a 2nd income earner like a spouse. Sometimes taxpayers will owe more than the company withholds from your pay. Do you have a secondary source of income? Don’t forget to account for it when doing your taxes. Many people have a second job or income source these days. Don’t forget that this income is taxable. (Business income over $400 must be on your tax return.) This is especially true if you have a full-time job and a side gig. So, be sure to save money for the taxes owed on that extra income. Not paying this supplemental income tax can come back to haunt you in the future with an IRS audit. Whether you’re selling handmade soaps on Etsy or teaching online in the evenings, keep track of all income and expenses, and make sure to put some of it away for taxes. You’ll be glad you did when tax season rolls around. Lastly, if these tips weren’t enough for you, the IRS posted its own list of common errors. Some of them overlap, but not all. If you’ve already filed your tax return and want to check on your refund, the IRS has set up a handy “Where’s my refund?” page.